Kaiseki is a traditional Japanese multi-course dining experience, with seasonal ingredients and artistic plating. The courses vary, but typically consist of small portions, lightly seasoned so that the guest can savor the true taste of the base ingredient. A typical kaiseki course will include: an appetizer, sashimi, sushi, a simmered dish, a grilled dish, a steamed dish, soup, and dessert. 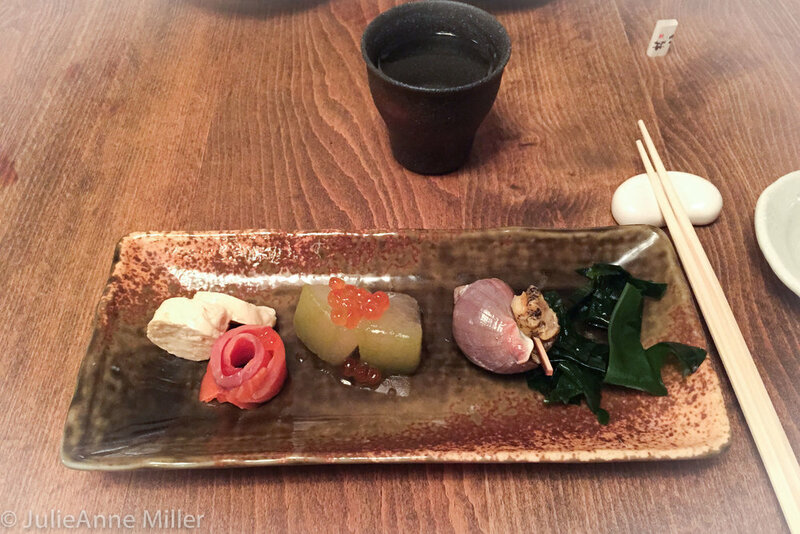 Kaiseki is designed to be slow and intentional, with colors and tastes that reflect the local region and season. Every chef will prepare his or her own version, but the essential ingredient is mindfulness. You may find very simple kaiseki at temples, mid-range versions at hot spring spas or hotels, and crazy expensive kaiseki at michelin star restaurants. I enjoyed this Kaiseki meal at Gonpachi Nishi-Azabu in Roppongi district. The dessert was three ice cream mochi - green tea, strawberry, and vanilla ice cream wrapped inside a soft rice flour dough - and my co-workers snatched them up before I could take a photo! Tip: never leave your dessert unattended after several rounds of sake. Fun fact: Gonpachi is known as the "Kill Bill" restaurant because it's interior was the inspiration for the fight scene in Quentin Tarantino's movie Kill Bill. Their sake menu is insane, with something for any budget or taste.